Posted: Monday 19th October 2015 in Uncategorised. Summit and Argos have been shortlisted in two categories atthe 2015 UK Search Awards, taking place next month in London. The UK Search Awards aim to celebrate the expertise, talent and achievements of the search industry, and are now in their fifth year. 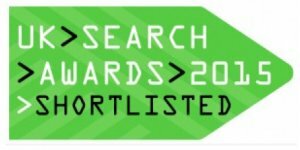 In 2014 Summit was thrilled to take home the award for PPC Campaign of the year, and this year we have been shortlisted along with our client, Argos, for Best Use of Search in Retail and Best In-house Team. Our ground-breaking work with Argos, using our performance marketing platform, Forecaster, has won multiple awards over the past eighteen months, and has received seven nominations in the last two months alone. Summit’s innovative and industry leading use of search has enabled Argos to sync their paid search ads with TV advertising, weather changes and annual product seasonality. These variables all have an impact on customer buying behaviour, and, using Forecaster, Summit is able to react in real time to these external factors and ensure Argos’s ads are in the right place at the right time. Argos’ paid search revenue has grown by 35% in the last year, and despite significantly increased budgets the cost of sale has remained consistently low. As part of Argos’ 5 year digital transformation plan, in 2012 Argos and Summit began to investigate if it would be possible to bring the management of paid search in house. It was hoped this would promote the importance of search internally at Argos and refocus the Summit team’s time, enabling us to concentrate on developing more bespoke marketing technology to increase Argos’ competitive advantage. Over the past year we have worked with Argos on recruitment and training of a new in-house team, which has now been successfully established for several months. We have defined a whole new working partnership between agency and client, opening up opportunities for positive change from both parties’ points of view. We are up against some stiff competition across the two categories, including Vodafone, MoneySuperMarket.com and uSwitch.com. The UK awards will be presented at the prestigious Ballroom in South Bank, London, on the 26th of November , and will be judged by an array of industry leaders and experts.